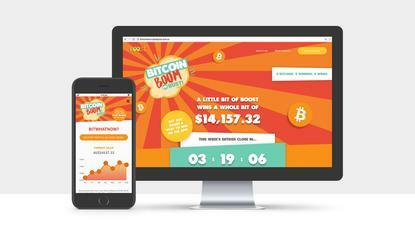 Boost Juice is claiming to be the first retailer to give Bitcoin away to customers after launching a new four-week campaign in Australia. Commencing 19 February, the promotion requires customers to guess the value of a Bitcoin at 12pm every Monday through Boost’s new-look mobile app, also launched this month. The individual who makes the closest guess each week will score themselves a Bitcoin, currently valued at more than $13,700. Boost Juice partnered with Australian cryptocurrency exchange, CoinJar, on the new activity, with the pair jointly covering the costs of acquiring Bitcoin. Each week, customer rankings will be published in real time on a leader board in the app, as well as in stores nationally. A week-long graph of the ups and downs of Bitcoin’s value will also be available. Boost Juice chief technology innovation officer, Christian McGilloway, said tapping into Bitcoin is on trend with what consumers are thinking and talking about. In addition, innovation is a key pillar behind all of Boost’s campaigns, and gamification a key capability underpinning many of its digital activities, McGilloway said. Two years ago, for example, the brand gave consumers the opportunity to play for vouchers via its ‘Free the fruit’ game. During the campaign, 400,000 people played for an average of 179 minutes per person. Last year, Boost tapped into chatbots with Facebook Messenger through its ‘mash up’ activity. In this instance, people were talking to a PC that was pretending to be a fruit, such as a banana or coconut, pretending to be a human. Run as a kind of dating environment where each fruit had a distinct personality, McGilloway said the result was high engagement, with people talking every day to the chatbot during the two-week campaign. In order to enter the Bitcoin race, consumers need to be given a voucher, either generated automatically via the app when they purchase a click-and-collect item, or when they make a purchase in-store. They then either make a guess as to what the value of Bitcoin will be at 12pm Monday, or have a random number generated for them. Guessing closes 24 hours prior to the winner being selected and only one consumer can guess a specific value each week. The program is running for four weeks, with one bitcoin given away every week. At time of press, early figures suggested a 67 per cent increase in app usage following the launch of the campaign. More than 3500 entries/guesses had also been made within the first two days. Key ambitions for the campaign include driving loyalty membership as well as in-store traffic and sales. Being able to analyse customer behaviour is another key component, such as whether a consumer is a lapsed versus new customer, and if the Bitcoin giveaway lifts sales frequency during and post-campaign. “It's exciting that as a brand, we’re playing alongside our customers. We have no idea if we are giving away $8,000 or $28,000 next week,” McGilloway added. Boost is also working on integrating cryptocurrency payment into its app “in a way that offers a great customer experience”, he said. In addition, the retailer is looking at bringing chatbots into the new app for handling simple customer service stuff, such as locations and store opening times.